(AINA) -- Coptic protesters who were in front of the TV building in Maspero, waiting for the curfew to end to go home, came under attack from the Egyptian Army, after Coptic representatives agreed yesterday to suspend their 9-day sit-in until March 25. 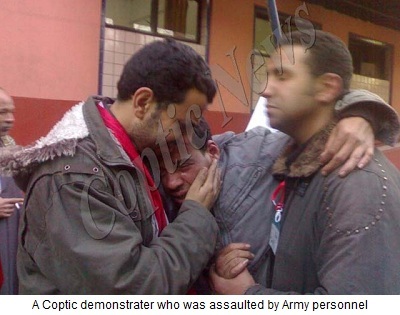 The army also attempted to assault Father Filopareer Gamil, one of the leaders of the sit- in, but Coptic protesters shielded him with their bodies. Father Filopateer said that a Coptic demonstration is gathering in front of the hospital where the wounded have been transferred. "An army official came to the hospital to pacify the Coptic youth but they refused to meet with him and are demanding an investigation by the military." According to Dr. Gameel Ebeid of the Coptic hospital in Cairo where some of the wounded demonstrators are under medical treatment, 15 Copts have broken limbs, head wounds as well as burns from electrified batons. He said the patients told him that they had agreed with the army to evacuate the area in front of the TV building at 6 AM after the end of the curfew and after cleaning up after yesterday's demonstration. "Suddenly at 3:45 AM they were attacked heavily by the army unit present at the TV building. The youth started running and those who were caught were stripped of their mobile phones so as not to take photos, and their personal belongings were confiscated. I personally saw 15 patients, 14 of them had their feet broken, wounds in the head and were nearly unconscious from being beaten with electrified batons. One protester underwent an operation to put an implant in his arm." Haytham Camil, an eyewitness interviewed by Mariam Ragy, said the army shot some Coptic protesters with live ammunition and there were wounded who were transferred by army ambulances. "We do not know their whereabouts, their names or even how many there are." The Coptic advocacy group Katiba Tibya, headed by Father Mattias Nasr, who participated for 9 days in the sit-in, has asked Coptic families who are missing any family members to contact them urgently. Lawyer Hany Ramsis, one of the organizers of the sit-in who was present at the time of the attack, told Coptic Free Voice "We were surprised by the army attack. The youth were cleaning the place and some families who came from the provinces were packing. There were around 500 people still there at the time of the attack." He said the soldiers cut the wire fences and started running towards the people, shouting "Allahu Akbar." Ramsis was one of the 10 Copts representing the demonstrators who met on March 13 with the Prime Minister and members of the military council to present their demands. The sit-in afterwards was suspended "to give time to the government to meet all their demands," said the Coptic statement. "We met with the authorities and we agreed to suspend the sit-in because of the situation of the country, and many Copts were against this decision. However, we cannot accept that our youth would be beaten and humiliated," Ramsis said. He demands an official apology for what happened, and the commander who gave the order for the attack to be prosecuted. "We trust the army, but where are my citizenship rights, and where are my rights as a Copt?" Ramsis said he is in possession of video evidence and plans to pursue legal action against the army. Coptic activist lawyer Sherif Ramzy, who was also assaulted, said that it is a big shame for the Egyptian army that its soldiers shout "Allahu Akbar" before attacking unarmed citizens. "This only shows that the army is infiltrated by Islamists."